Here is some good information about hypothermia and frostbite – how to prevent them, and what you can do if you think someone is suffering from either condition. 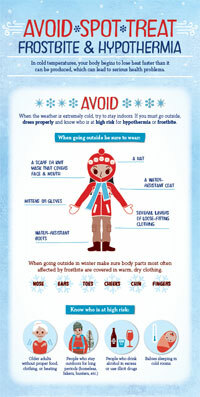 Hypothermia, or abnormally low body temperature, is a dangerous condition that can occur when a person is exposed to extremely cold temperatures. Stay safe this winter by learning more about hypothermia, including who is most at risk, signs and symptoms, and what to do if someone develops hypothermia. Even if the victim appears dead, CPR should be provided. CPR should continue while the victim is being warmed, until the victim responds or medical aid becomes available. In some cases, hypothermia victims who appear to be dead can be successfully resuscitated. Please raise the temperature in your home 2 to 4 degrees above your normal setting. Take all programmable thermostats out of setback mode and set on a permanent HOLD. If you have a furnace; replace the filter. Make sure air vents and radiators are not blocked or obstructed.